Cody Colchado Jr. is 55 years old. He was born in Kingsville, Texas and was raised in Bakersfield, California. He currently lives in Linn/San Manuel, Texas. Colchado is a motivational speaker and fitness consultant with a bachelors and masters in kinesiology from the University of Texas at Pan American. He was born with a 75% -85% hearing loss. It wasn’t until 2nd grade that it was diagnosed. He learned to deal with this loss by reading lips. He didn’t want to wear hearing aids because he believed he was laughed at by classmates and that technology during the early 70’s was horrible. Sports helped him deal with all the frustration of not being able to hear. In 1981 at the age of 17, during a high school football practice, he had a freak football accident which caused vision loss. He was diagnosed with Retinitis Pigmentosa Usher Syndrome, type 2, a condition which is characterized by deafness, night blindness and the loss of peripheral vision. After the accident he only had 5 degrees of vision left. He started power lifting, and loved it. He lifts weights for health as he worked part time at the legendary Jack La Lane Health and Fitness Spa in Bakersfield. “Lifting helped me deal with all the anger and frustration I had in dealing with the loss.” He was introduced to powerlifting at the Strength and Health Barbell Club. As he continued lifting, he began to compete. His first competition was in 1983 in Long Beach, California where he placed 3rd in his class. He later joined the United States Association of Blind Athletes. He began to compete internationally, and after 10 years, he not only competed, but was the assistant head coach for USABA’s National Team U.S.A for the next 8 years. During this time, he trained at the Olympic Training Center in Colorado Springs, Colorado. He is currently a 32 time world champion in power lifting for the blind and able bodied in ATA, IBPF, IBSA, and WADAL power lifting federations. He holds 25 world records in the squat, bench press, dead lift total and has 12 best lifter awards in those federations. He has won 15 Texas state championships and numerous nationals. In 2012, he was inducted into the World Association Benchers and Deadlifters Hall of Fame. In 2013, during Bakersfield College one hundred years celebration, he was one of One Hundred Golden Knights, who were honored with this award. In 2016, he was inducted to the Rio Grande Valley Sports Hall of Fame. He was one of 20 disabled athletes that were featured in a book titled, Running Through Road Blocks. In March of 2018, he was featured in a segment of the Texas Country Reporter. In 2015, he was the first American to win the North American Disabled Strongman Championship that was held in Ohio, and the World’s Strongest Disabled Man, standing division that was held in Iceland. 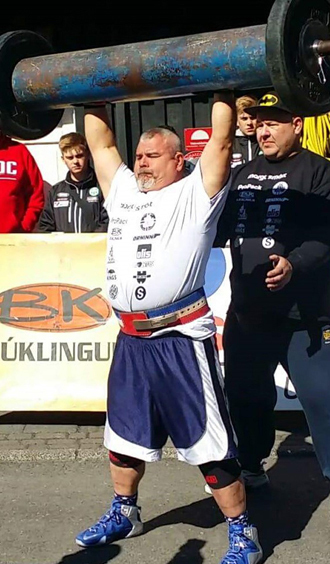 In 2017, he competed in London, England in the World’s Strongest Disabled Man held with the London Parallel games and placed 6th in the standing division.